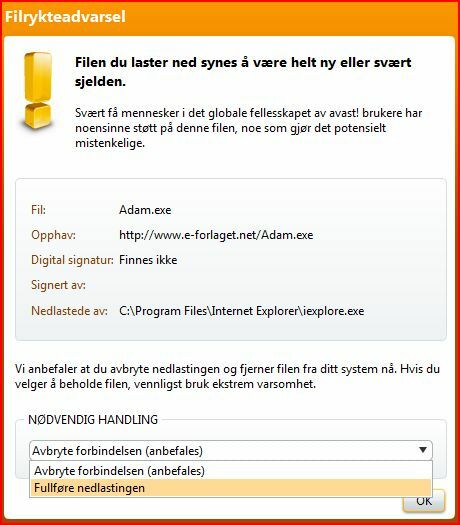 Because e-forlaget does not have a security certificate, downloads of our executable publication files will most likely generate some nasty warnings on your computer. These certificates only would have ensured that we had paid a substantial amount of money to the issuer. A lack of such a certificate does not imply that the publisher (i.e. e-forlaget) is unreliable or a virus maker. But the warnings presented, may look suspicious and ugly. e-forlaget are not a commercial business. Therefore we have not paid our annual fee. Perhaps in the future we will have to "bite the dust", but for now we kindly ask our readers, listeners and customers to take the nasty warnings lightly. We guarantee that our executable files are not infected with viruses, trojans, commercials or other bad things often found in the dark corners of the internet. Even so, you know that e-forlaget™ is the publisher, and you may securely select "Run anyway" (Kjør likevel). If not, you will miss out on our exciting and funny programs. Our publications are only unknown because we did not register a certificate and pay the fee. Avast (and maybe other AV companies) have found it in their heart to show nasty warnings for any executable file downloaded from the internet, if the origin of that file is not commonly known. Because we are not as big as Microsoft or Adobe and our files do not get downloaded as often as their files, Avast thinks it can claim our program files to be "potentially dangerous". Many developers have complained but to no avail. Avast has only moderated their warnings slightly. We can only appeal to common sense and faith in our good intention. If you see a warning similar to the above, we ask you kindly to choose "Continue downloading" (or a similar choice). If not, you will miss out on our exciting publications and funny applications.